Homemade Sweet Hot Pickles are a slightly sweet, slightly hot pickle that's crisp and delicious. These delicious pickles also go by the name "Wickles". I've been trying to get a jump on some home canning for holiday gifts and these sweet & hot pickles were first on my to make list. The first time I tasted these pickles was a couple years back during a holiday get-together. A family member brought a jar to Thanksgiving and shared them with everyone. I loved the taste sort of sweet and a bit hot all at the same time. I thought it was such a tasty combination. If you like hot and sweet you most definitely must try these pickles. They reminded me of the sweet and hot jalapenos (Texas Cowboy Candy) just not as hot. 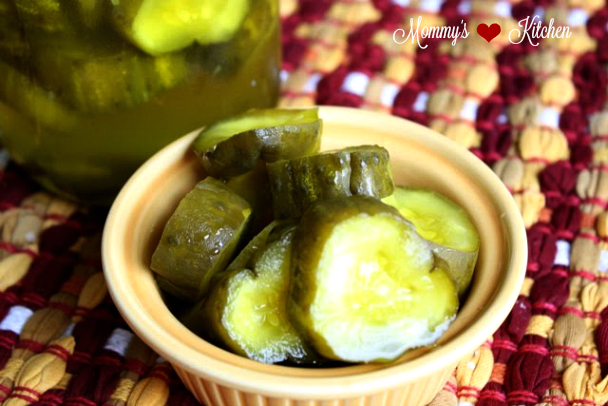 This recipe is very inexpensive to make using store bought dill pickles. You can purchase gallon size jars of pickles at Sam's Club or Walmart for under $4 and a large size of jalapenos for under $3. You can make several jars of pickles perfect for sharing. Take one gallon of dill pickles and one large jar of sliced jalapenos. Cut into chunks and discard the pickle ends and the pickle juice. Return the pickles to the gallon glass jar and start adding granulated sugar. Add as much sugar as the jar will hold. After adding the sugar start adding the jalapeno juice the same way as the sugar (as much as it will hold). You will have to shake the sugar as you add it for the jar to hold it all. When you have about half of the sugar in the jar shake the jar vigorously and add the remainder of the sugar. You can also add a few of the jalapenos (be careful because the more jalapenos you add the hotter it will be). Put the lid on tightly. For the next 7 days you will turn the jar every day rotating from top to bottom. (Sit with top of jar up one day and upside down the next). Refrigerate the jar while turning. When the 7 days are up, add the pickles to smaller jars and process in a hot water bath. Drain all the pickle juice out of the pickle jar. Remove pickles and cut into large chunks. Add the chunks of pickles back to the pickle jar. Remove most of the jalapenos and put them into a smaller jar., reserving a few jalapeno slices and the jalapeno juice. Add a few jalapeno slices to the pickles. Keep in mind that the more jalapeno slices you add the hotter the pickles will be. Start adding the sugar to the jar (add as much sugar as the jar will hold). Then pour enough of the jalapeno juice that you can get into the jar without it overflowing. Put the lid on tightly and shake. Place the jar in the refrigerator. For the next 7 days you will turn the jar every day rotating from top to bottom. (Sit with top of jar up one day and upside down the next repeat this everyday for 7 days. When the 7 days are up, add the pickles to smaller jars and process in a hot water bath. Sterilize all the lids, rings, and jars and then add the pickles to sterilized half pint jars, and process in a hot water bath. Processing time: For half pints process 5 minutes and for pints process 10 minutes. yummy, that looks delicious! 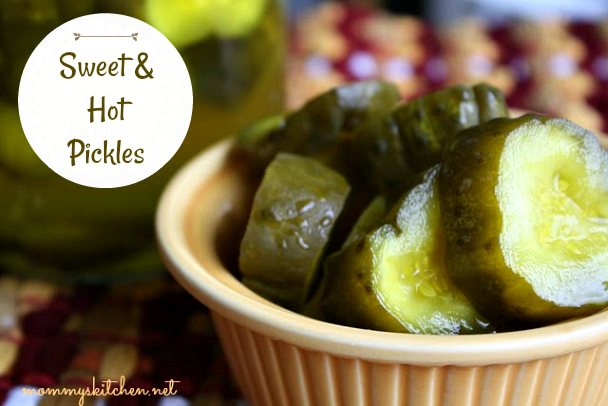 i've neverhad sweet and hot pickles but sounds great! Those sound unbelievable. I love those sweet hot jalapenos, I just bought some as a matter of fact. I think I would love these too. They seem so easy, I will be trying these soon! Tina, you are so smart. I mean, is there nothing you can't make? These pickles sound quite tasty. I have never canned anything in my life. But you make it sound so easy. I'll just have to roll up my sleaves and give it a try. If I'm successful, I'll send you a pic for your approval. Hugs. Gonna definitely try this. It sounds a lot like "Wickles" that we got in Fredricksburg, Texas. Yum, yum! those sound so good, makes me miss my grandmother who used to make those ever year with garden items! Okra too! Oh my those pickles sound so yummy! That would be a big hit at our house! Thanks for sharing. I have a batch of these pickles in the frig right now. My husband love's hot stuff and he has bought jar's ofthese pickles for $8.00 a quart. I can every thing I can and hate paying $8.00 a jar.Plus I know what's in what I can. I've never heard of these! Are they spicy? Kids & I don't do spicy, but they LOVE pickles! I love WICKLES and buy them all the time. BUT they are pretty costly. This sounds pretty easy. Do I need to boil the mason jars, just like when I'm doing jam or jelly????? Or can I put the pickles in them cold? I cant wait to do this. I am gonna have some really great holiday presents this year thanks to YOU!!! * If making the pickles ahead of time they can be canned. I just process the jars as you would for canning. I sterilized all my lids, rings and jars and then added the pickles to hot jars and processed in a hot water bath as if I was canning jams or jellies. For half pints process 5 minutes and for pints process 10 minutes. Tina, Thanks for the great recipe, I can't make enough of these. I hate throwing things away and was ending up with bunches of jalapeno slices, sooooooo..... wait for it..... I put the slices in a gallon jug, filled with sugar same as pickles, then filled with leftover pickle juice, followed turning instructions and now I have sweet and hot candied jalapeno slices. They are proving to be almost as popular as the pickles. hi! I'm candy and i just have a few question. I'm wandering if there i a fast way of making them where they don't have to set for seven days. And the other question is do they have to be refrigerate and why. I love wickle pickles. If these come anywhere near the taste I'm making my own. Now smith farms in Alabama has some that are so good but the price is a sticker shock....but so good I just about ate the jar befor I got home. Thank for recipe. How much sugar for the gallon jar? You add as much sugar as the jar will hold, so there is no set amount and it all depends on the size of the jar. Brandy, I am wondering the same thing.. did you ever get an answer? Put the lid on tightly and for the next 7 days you will turn the jar every day to rotate from top to bottom. (Sit with top of jar up one day and upside down the next.) Refrigerate jar while turning. When the 7 days are up, add the pickles to smaller jars and process in a hot water bath. Sterilize all the lids, rings, and jars and then add the pickles to sterilized half pint jars and process in a hot water bath. For half pints process 5 minutes and for pints process 10 minutes. Once the pickles are done do you leave the jalenpenos in there? These look delicious! I have always wondered how to get the pickle chips a little thinner than the ones you show in your pictures. Is there any easy and quick way to get thin pickle chips? Thanks for sharing your recipe!